TUTUNUI-WANANGA-LOKAHI: CETACEAN GENOCIDE SEALING THE FATE OF 'HOMO SAPIENS'? CETACEAN GENOCIDE SEALING THE FATE OF 'HOMO SAPIENS'? What we are witnessing is the mass-genocide of the Earth's highest beings, blatant expressions of human ignorance, stupidity and violent aggression, using the latest in technology, in the name of our unwavering worship of our false 'gods' of money, greed, and most lethally, the delusional and psychotic beliefs we cling to about ourselves as 'modern man': that WE are the 'pinnacle of creation', that what WE do somehow matters far more than the rights to exist of all other living things, that we are homo sapiens, 'man, the wise.' A dark irony is that 'man, the wise', in his great wisdom, is literally taking himself out, scientifically and methodically; if he alone were being affected, one could say that justice was being done but the sad and dire reality is that the 'wise ones' are taking out all living beings, reluctant companions in our joy-ride to hell. Such are the implications of mis-use of our immense powers of creativity, the result of our deviation from the sacred path of the Great Spirit. Who will speak for the whales and dolphins, for the Earth herself? And who are their murderers? Names can be named, fingers can be pointed at organizations, bureaucracies, individual influential decision-makers...the reality is that it is a mentality that is driving the destruction, a MOE, or 'mental operating environment' shared in varying degrees among all 'civilized' people in all countries. Ultimately we are ALL to blame, we are ALL responsible for what our species is doing to the Earth, to 'mitakuye oyasin', 'all our relations.' When we stop functioning as 'soldiers in World War 3' ourselves, then we might have a meager chance of slowing the juggernaut of ecocide; if we don't begin by changing ourselves, by reprogramming our daily routines, we stand no chance whatsoever of affecting the behaviour of the U.S. Navy or the global army of energy and resource extraction corporations. 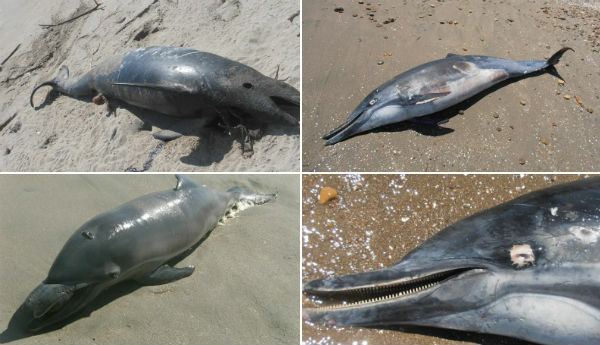 Thousands of cetaceans are washing up on the shores of northern Peru, not only dolphins but other kinds of whales as well. 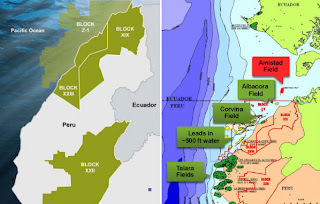 These deaths, which represent only the very tip of a massive 'ice-berg' of unseen mortality, are occurring in a region of some of the heaviest hydrocarbon exploration in South America. 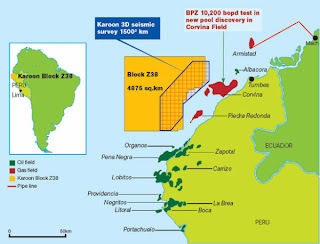 Houston-based BPZ has been conducting seismic and electromagnetic surveys in the area over the past few months. 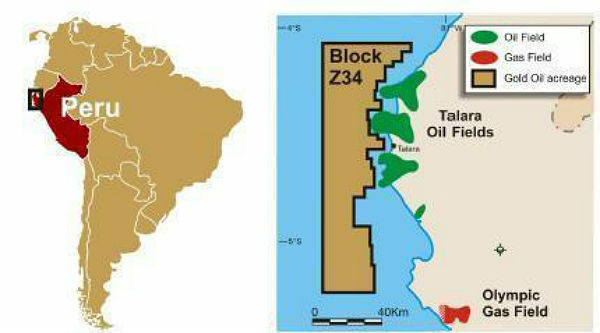 Other companies with licenses to explore in this area include London-based Gold & Oil and Petrotech, formerly a Peruvian company now owned by South Korea and Colombia. Like their sister company Anadarko, a Texas-based oil giant implicated in the Christchurch earth-quakes and New Zealand cetacean strandings, these exploration corporations hire geophysical exploration contractors who operate 'research vessels' armed with 21st century technologies like seismic air-gun arrays which are functionally almost identical to the low frequency active (LFA) sonar systems deployed by the U.S. and NATO naval forces. These technologies generate power levels on the order of tens of thousands of watts per blast and generate a 'kill zone the size of Texas.' According to an Anadarko representative, over 100 of these 'research vessels' would be in operation globally at any given point in time. The likely result might be that, given that most exploration takes place in relatively shallow coastal waters where cetaceans spend most of their time, hundreds of thousands or even millions of beautiful cetaceans might be dying right now. If we all stopped using so much hydro=carbon fuel in our light-years of needless driving, we might choke off the trans-nationals a bit, but it's possible that an even darker agenda could be in operation, that is, the imperative to rid the Earth of not only cetaceans but biological life as she currently exists. The U.S. Navy has been granted...by one of its own subsidiaries, the NOAA and NMFS...permits to 'take' 11.5 million marine mammals over the next five years. It makes me wonder what their legal 'take limit' on human beings is for this same time period. Of particular note are the materials concerning the 'new generation' of electromagnetic weapons, of which HAARP is only one example. HAARP is primarily operated by the U.S. Navy. 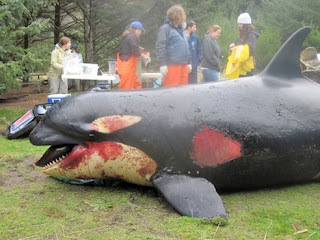 Please read the other recent postings on this blog for information on cetacean deaths and military-industrial activities, as well as the 'roaring silence' offered in response to these on-going atrocities by high-dollar, high-visibility 'save the whales' organizations. 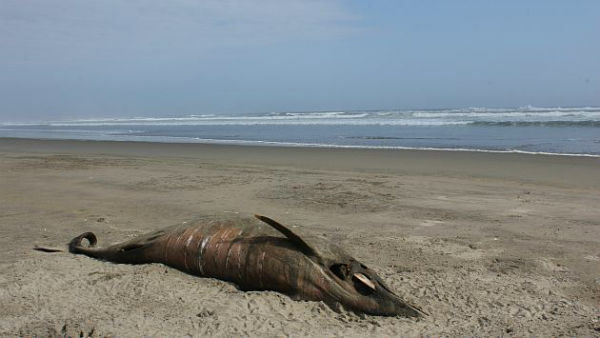 More than 3,000 dead dolphins have washed ashore in last 3 months along the stretch of coastline in Lambayeque, north Peru. On March 28, Dr. Carlos Yaipen Llanos of the Peruvian-based marine mammal rescue organization ORCA and Hardy Jones (BlueVoice) counted 615 dead dolphins on 135 kilometers of beach north of San Jose. The representative of the Ecological Reserve Chaparrí, Heinz Plengue, indicated that only in recent days, 418 dolphins appeared stranded along 36 kilometers of the beach of Palo Parado area, opposite the island Lobos de Tierra, in Mórrope. "The oil companies use different frequencies of acoustic waves and the effects produced by these bubbles are not plainly visible, but they generate effects later in the animals. 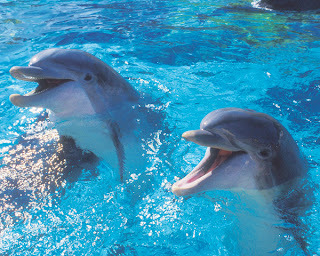 That can cause death by acoustic impact, not only in dolphins, but also in marine seals and whales." In 2003, scientists from the Zoological Society of London discovered that underwater sonar can lead to the formation of microscopic bubbles of nitrogen in the bloodstream and vital organs of aquatic mammals, afflicting the animals with a lethal condition commonly known as the Bends. Additionally, low-range acoustic sensors are suspected to cause disorientation and internal bleeding to exposed wildlife. As of this writing, Peruvian authorities have yet to identify the company whose activities may be leading to this grim toll on native marine life. According to Offshore Magazine, a trade publication of petroleum news, at least one entity, Houston-based oil company BPZ Energy, has been actively surveying the seabed along the coast of Peru since the beginning of the year. HOUSTON – Oil production from BPZ Energy’s Corvina and Albacora fields offshore Peru has been averaging around 3,920 b/d. BPZ also continues to work toward obtaining a joint venture partner for block Z-1. Last month, the body of a 3-year-old killer whale washed ashore in Long Beach, Washington, bearing injuries which indicate it had suffered severe trauma. While its exact cause of death may never be known for certain, one biologist who examined the orca says he believes the animal's fatal wounds were the result of an explosion -- leading some to suspect that ongoing training exercises by the U.S. Navy in the orca's critical habitat are inadvertently blowing up endangered killer whales. The dead orca, labeled L112, belongs to a protected killer whale population known as Southern Residents, of which as few as 87 individuals remain in waters off of Washington State and Canada. Yet despite this fact, and their listing as an endangered species, the U.S. and Canadian Navies routinely detonate bombs and use sonar in the orca's narrow habitat, both of which are potentially lethal to marine life.